Did you know that a starling influenced one of the greatest classical composers in history? Read an excerpt from Mozart’s Starling by Lyanda Lynn Haupt about how this bird came into Mozart’s life. Pet birds and family portraits were both symbols of social rank. 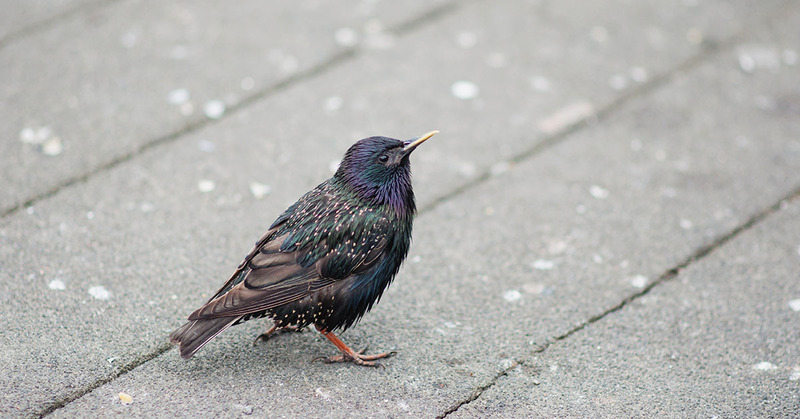 Starlings were common, native birds that any peasant could pluck from a nest. It says a great deal that the status-conscious Mozart chose a starling for his pet—it means that he didn’t want just a bird, he wanted this bird. Where does all of this put Star in the Mozarthaus? For Mozart, there could be only one answer: Where the music was. Where Star could be watched, twitted to, flirted with. Where he could join the music, pester the maestro, pluck at the violin strings, pull at the quill pen, rip the ink bottle. The Mozarts, always, made their own music, their own bohemian life. The elegy that Mozart composed for Star when he died shows such a keen understanding of the starling personality, such a personal knowing of his bird, that the two must have shared each other’s company day to day. “He was not naughty, quite / But gay and bright.” The little yellow statue of Star in the Mozarthaus should go in the study.